-- a Christian Devotional on giving it to God. age I found the little brown purse at a rummage sale years ago and discovered that it was perfect for me. But over time, my backpack purse started to show signs of wear. And, I found that its coloring had an odd tendency to “melt” in the hot sun. It couldn’t even handle our mild Pennsylvania summers, so I’d have to stick it in the shade at baseball games and outdoor activities and deal with the goo later. I knew it was strange and after a few hot summers, the purse started looking a bit shabby. But still it worked for me and I wasn’t ready to part with it. A few weeks ago, my bag’s front zipper finally blew out and I still continued to use it. I could do without a front pocket right? I’d carried the ugly purse on my back for years, no reason to switch now. I mean, why do something different? I thought long and hard about my bag situation yesterday and suddenly it reminded me of something spiritual. Something God sees that maybe most of us do not. You see, I think we all have a tendency to hang on to our ugly, broken bags. And many times these are burdens we aren’t meant to carry. Now, I’m not talking about bags we can touch, like mine. I’m talking about intangible ones that maybe God wants us to get rid of or hand over to him. 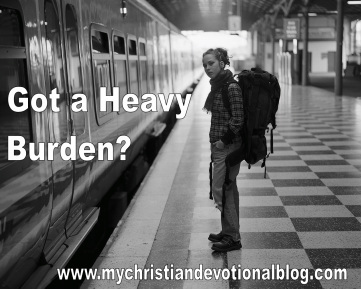 Sometimes I think we get so used to carrying our burdens that we cling to them because they bring us comfort and a false sense of responsibility. If we’re not worrying about it, caught up in it, downtrodden by it -- then who will be, right? Even though our bags may be heavy, we shudder at the thought of letting them go. Now, it’s important to note that although there are some burdens that God wants us to be free from, there are others that God puts in our hearts and lives for a reason. But he wants to help us carry them. One of my favorite devotional writers is Oswald Chambers. He was an evangelist and teacher who lived in the early 20th century and his daily devotional “My Utmost for His Highest” has helped shape my Christian walk. Wow. What a freeing thought. Waiting in the doctor’s office a few days ago, I observed an older woman standing at the front desk telling the receptionist about how her failing health was limiting her. I felt sad for the woman and after finding a Gideons Bible in the waiting room, I decided to give her a Psalm to read. Finding a good one, I offered the Bible to her and encouraged her to read the scripture. She looked at me with big blue eyes empty of joy and peace and told me that she couldn’t read it because of her glaucoma. I felt so sad for the woman and wondered what her life was like. I know that the burdens she was bearing would have looked way better on God’s shoulders. I no longer carry around my ugly, brown bag. It was tough to get rid of something I was so used to – but freeing at the same time. What are you carrying on your back today?